In the short run, however, the golden rally looks exhausted and due for a pullback. Gold prices are testing the underside of uptrend resistance. Similarly, the inflation expectations ETF (RINF) is displaying a similar technical pattern of approaching trend line resistance. When I turn to gold equities (GDX), the silver/gold ratio is exhibiting a negative divergence that is not supportive of further strength. Silver is the poor man’s gold, and it tends to have a higher beta than gold. The underperformance of the silver/gold ratio is therefore another short-term cautionary sign for gold bugs. 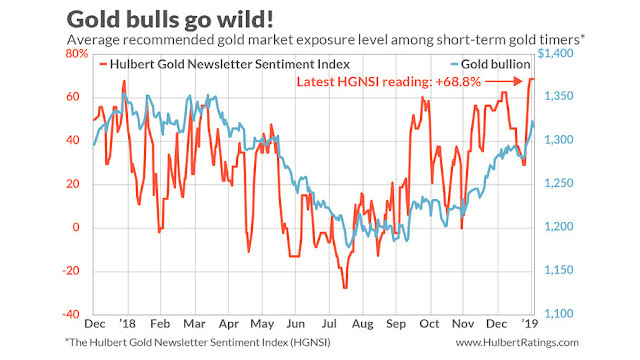 In addition, Mark Hulbert pointed out that the sentiment of short-term gold timers is an off-the-charts bullish reading, which is contrarian bearish. 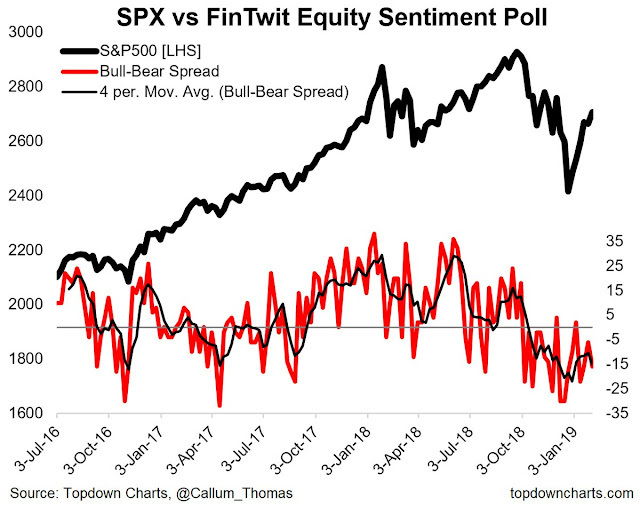 Contrast those sentiment readings with Callum Thomas’ weekly (unscientific) Twitter poll conducted on weekends, which still shows respondents to be net bearish even after last week’s advance. Stock prices are climbing the proverbial Wall of Worry. In conclusion, while the longer term outlook for gold prices is bullish, this precious metal appears overextended in the short-term. 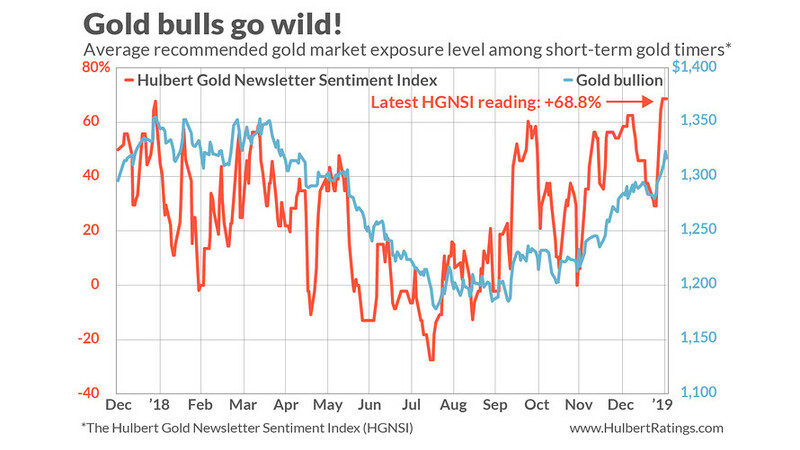 The inverse relationship between gold and stock prices implies a bullish outlook for US equities. However, this does not mean that traders should pile into stocks with abandon. The stock market is highly overbought, and it can either consolidate or correct at any time. Here are a couple of cautionary signs that I am watching for. 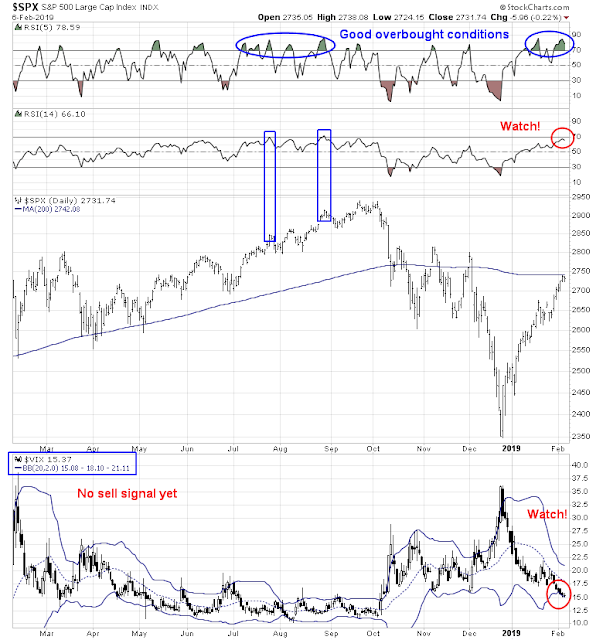 RSI-14: While the series of overbought readings flashed by the RSI-5 indicator could be signals of “good overbought” conditions, an overbought reading by the longer term RSI-14 indicator has historically been a cautionary sign of an extended market. 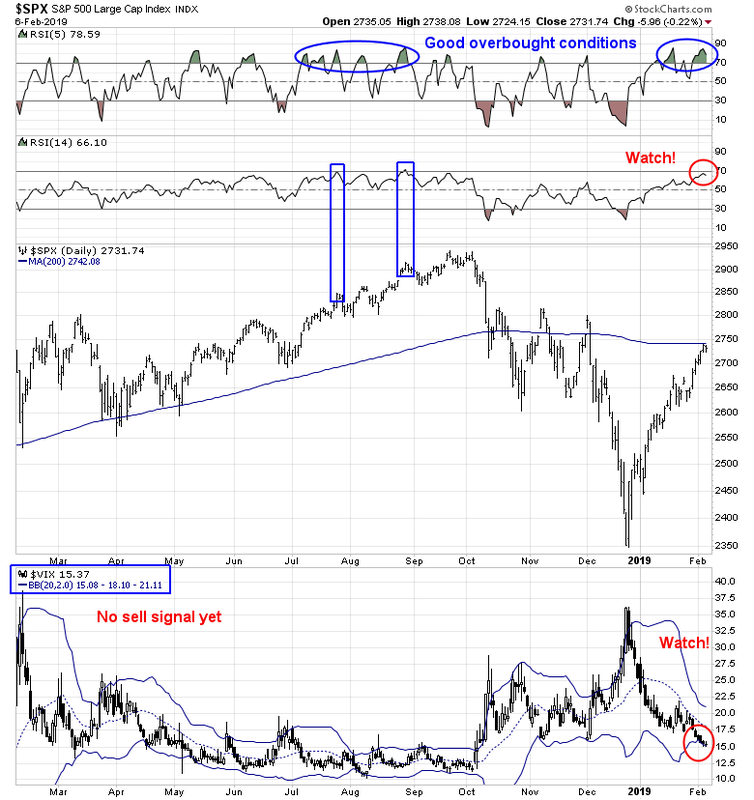 VIX below lower BB: In the past, the VIX Index falling below its lower Bollinger Band has also been another cautionary signal for the stock market. Intra-day dips below the lower BB isn’t enough, it’s the closing price that raises the red flag. Watch for it. My inner trader went long the market earlier this week. He is bullishly positioned, but he is watching these triggers as signals to exit his long positions. 400 points… handles…. clams… whatever then? From 2350 Dec 24 to about 2750 today? You are correct. My mistake. I was fixated on the 200 dma. lol, ok, sorry. I learn a lot here so I was ready for another round. I really enjoy and appreciate your work Cam. See Mark Hulbert’s graph above. 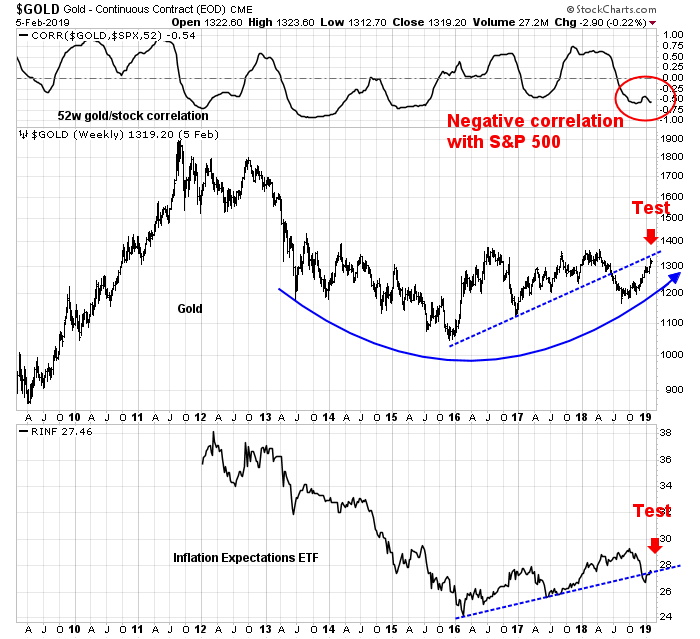 A retest of the 1200 $ per oz price of gold would be a very important bottom, if it were to happen. Even 50% Fibonacci retracement (1300-1200 = 100$) to 1250 $ per oz. would be a good entry for the next leg up in gold (to say 1600 give or take). Cam or DV, what time frame do you in mind to achieve your target price for gold? 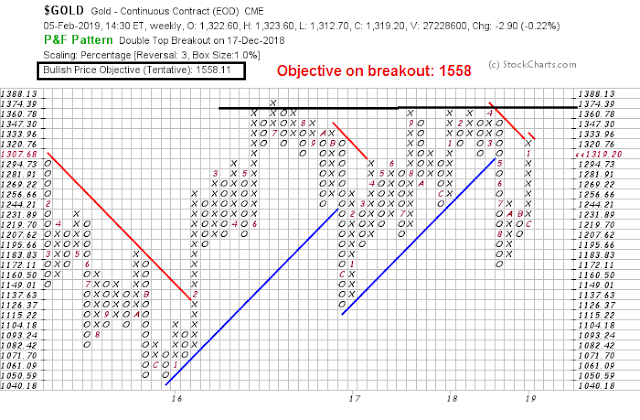 No upside breakout is assured, but if gold does break out, I would expect that it would achieve its upside point and figure target of 1560 in the next 3-4 years. As I noted in the comment a week ago, my analysis said we were approaching a short term top for SPX and I was looking for max upside of 2735. This week’s high so far of 2739 intraday is close enough to call the ST high. Next should be around a 2% pullback at minimum and then another leg up to 2800 or even possible double top test of 2950 before an intermediate-term top. But there is a hitch… My E-wave count shows 3 wave up completing here. So the expectation is that a 4th wave pullback of 2% or so sets the stage for a 5th wave up to 2800 or even 2950. But that assumes this is an impulsive rally which would signal a the first leg of a new bull market underway… I do believe that is the case. But what if I’m wrong and this is a bear market rally?… Well then this week’s top forming here would be the start of the next leg down in the bear market… Yikes! First warning sign for bulls of this doomsday scenario would be to close below 2700. Major red flag would be to close below 2650.